Peanut Butter Baked Oatmeal Cups with Chocolate! This oatmeal recipe is an easy make ahead breakfast perfect for busy mornings. 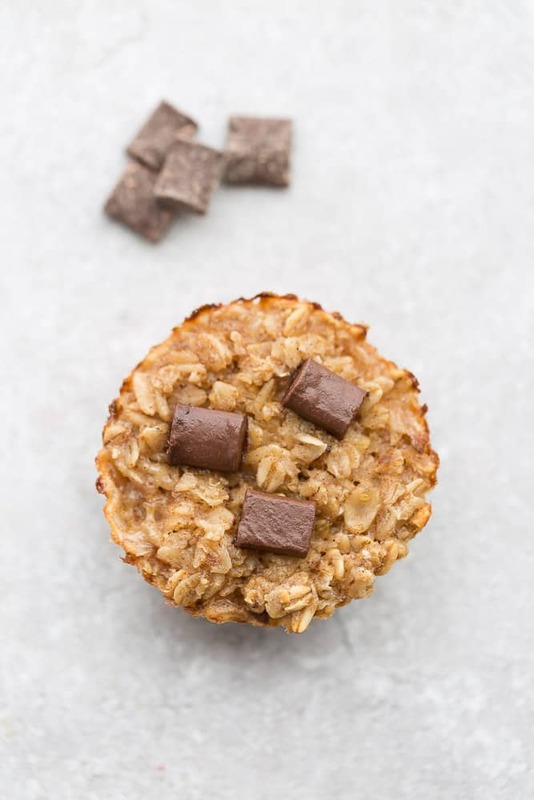 The oatmeal cups are refined sugar free and made with wholesome gluten free oats, peanut butter and chocolate chunks. This Peanut Butter Baked Oatmeal with Chocolate is another delicious flavor combo. Who doesn’t love the combination of peanut butter and chocolate? It’s like having dessert for breakfast except this one is made with gluten free oats, no refined sugar and is dairy free.Plus, it’s a super simple recipe that comes together in just one bowl. You can make it ahead of time on your meal prep Sunday and then store any leftovers in the fridge or freezer for the week. Then when you’re ready to enjoy, just grab one in the morning and heat it up in the microwave or toaster oven. And the best part of all? 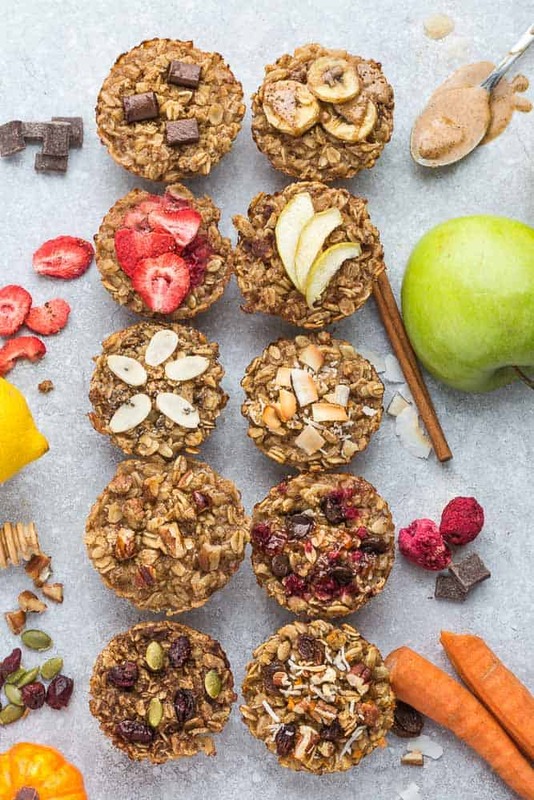 If you’re running low on time, these peanut butter baked oatmeal cups are super portable and make a delicious and healthy grab-and-go breakfast. 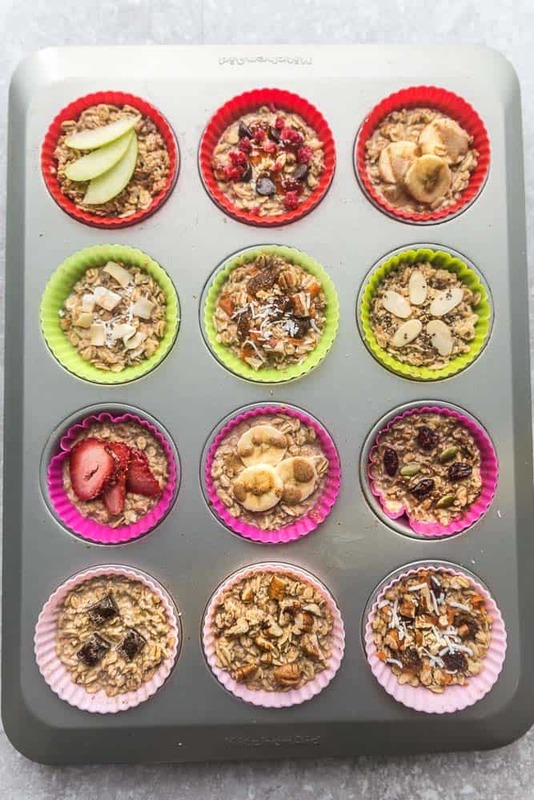 What I love about a simple recipe like this is that you can easily customize these peanut butter baked oatmeal cups with what you like or have on hand. 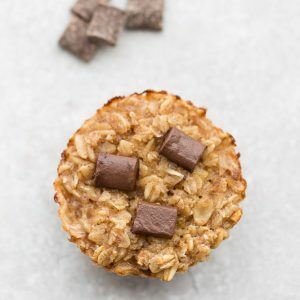 HOW TO MAKE BAKED PEANUT BUTTER OATMEAL CUPS? Start by combining one egg (or a flax-egg for vegan), almond milk and melted coconut oil. Stir in the maple syrup, baking powder, vanilla, cinnamon and peanut butter until combined. And finally, fold in the oats. Divide / fill your greased muffin tin or silicone muffin liners with the batter. Bake at 350 F for 20 minutes and you’ve got a delicious and healthy breakfast you can enjoy on the go. Before getting started, lightly coat a standard muffin tin with cooking spray or line a baking sheet with silicone muffin liners. Coating your muffin tin ensures that the baked oatmeal will not stick to the pan. To ensure your baked oatmeal cups are gluten-free, be sure to use gluten-free oats. You can also omit the nuts and nut butter if you have a nut allergy at home. Use your favorite combination of sweeteners. 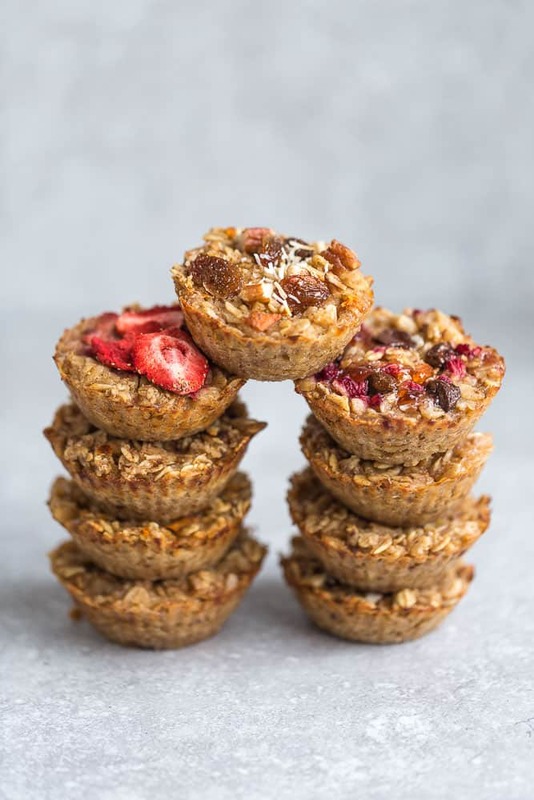 These baked oatmeal cups are refined sugar-free and use maple syrup to sweeten them up. Feel free to swap or add additional honey, coconut sugar, date puree, or your favorite low-carb sweetener instead. Fold in or sprinkle any add-ins of your choice. Coconut chips, freeze-dried fruit, chopped nuts or chocolate chips add texture and flavor. Or make a batch with several different flavors and customize individual cups for picky eaters. Store oatmeal cups in the refrigerator in an airtight container for up to five days. Or wrap them up individually and store in the freezer for up to 3 months. Reheat in the microwave or toaster oven to enjoy throughout the week. You can serve as is, with yogurt, almond milk, nut butter or some jam to liven things up. In a large bowl, mix the flax seeds and water to make the flax egg. Set aside until thickened (about 2 minutes) (Skip if using regular egg). After 2 minutes, whisk in milk, maple syrup, coconut oil, peanut butter, vanilla, baking powder, cinnamon, salt and fold in the oats. Stir in chocolate chunks. Divide batter evenly into prepared muffin tin or silicone muffin liners. Press additional chocolate chunks on top, if desired. Bake in preheated oven for 18-23 minutes, or until set.